The giraffe might be one of the most unusual-looking animals on Earth because of its long neck. As the tallest land-dwelling mammal, the giraffe boasts a neck that can be over 2 meters in length. The human neck is usually less than 12 centimeters in length, but both giraffe and human necks have the same number of cervical vertebrae. The giraffe neck’s impressive length comes not from more bones but from the same number of larger, longer and more massive ones. In a recent study, molecular geneticist Morris Agaba and colleagues showed that variants in a few key signaling pathways may have contributed to the giraffe’s impressive stature. Using whole genome sequencing, the researchers assembled two new Masai giraffe genomes, one from a wild giraffe and a second from the Nashville Zoo. They compared these genomes to that of the okapi, the giraffe’s most recent common ancestor, and cattle, which are more distantly related. Particularly striking variants in the FGF growth factor pathway drew the attention of the researchers. 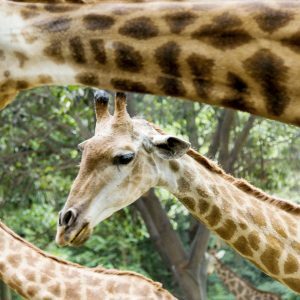 The team found seven unique variants in giraffes in the FGFRL1 gene, which is known to act as an inhibitor in FGF pathways, which normally promote growth. Previously, inhibition of the FGF pathway was shown to lead to bigger cells in chick embryos, which led another group to hypothesize that FGF signaling inhibitors might play a role in changing the size of the giraffe’s neck. But bigger bones alone aren’t enough. The giraffe’s striking figure would not be possible without changes to its cardiovascular system, which requires thickened vessels to withstand the high pressure needed to pump blood to over 5 meters. The authors found variants in two genes, BORG1 and RCAN3, which are highly expressed in the heart and may function in cardiac muscle contraction. Additionally, the giraffe’s increased height allows it to feed on acacia leaves and other toxic substances. Variants in genes involved in fatty acid metabolism and oxidative phosphorylation may offer protective effects, allowing the giants of the animal kingdom to eat plants that others cannot. This new study offers more questions than answers about the giraffe’s unique physique. Future studies are needed to conclusively show the contribution of each of these candidate genes to the physical divergence of giraffe into a distinctive species. It is clear, however, that the newly sequenced genomes of the giraffe and okapi offer many clues to the history of their species and to the function of these important genetic pathways. Genome detectives: New bioinformatics lab interprets genetic code. Read more in Fundamentals. Darwin Updated: Johns Hopkins Scientists Suggest Certain Genes Boost Chances For Distributing A Wide Variety of Random Traits and Drive Evolution. Read more. Four, Three, Two, One . . . Pterosaurs Have Lift Off! Read more. The Genetic Reality of a Jurassic World. Read more.